Despite two straight Peyton Barber touchdowns that closed the gap to just seven points for the Tampa Bay Buccaneers in the second half, the Atlanta Falcons defense stiffened when it needed to the most and iced the game with a late Tevin Coleman score, to knock off the Buccaneers, 34-20 on Sunday in Atlanta. 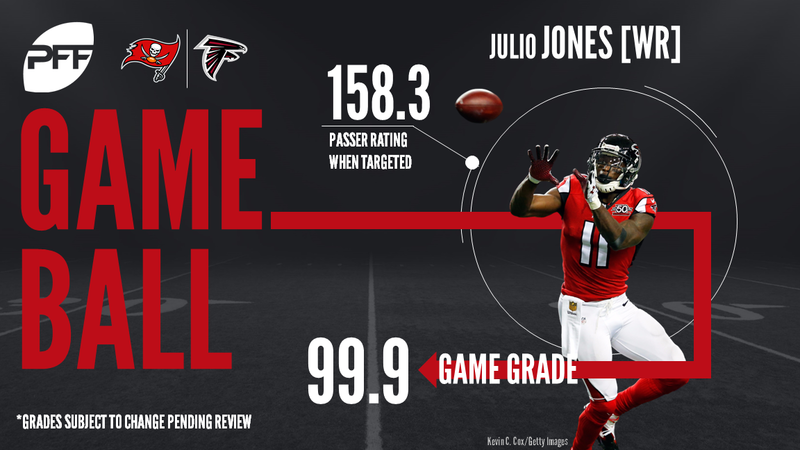 Falcons WR Julio Jones had a monster day against the Buccaneers coverage, hauling in 12 receptions for 253 yards and two touchdowns, including one score from fellow WR Mohamed Sanu on a trick play that set the tone of the game. Sanu brought in eight receptions of his own for 64 yards as quarterback Matt Ryan threw for 317 yards in the game. Without the services of injured RB Devonta Freeman, the aforementioned Coleman toted the rock 19 times for 97 yards and two touchdowns. On the opposite side of the ball, Barber found the end zone twice for Tampa Bay, but totaled just seven yards on five carries and fellow Bucs RBs Doug Martin and Jacquizz Rodgers could only muster 33 and 31 yards respectively. Backup QB Ryan Fitzpatrick, who had led the Bucs to two straight victories, played a mistake-free game but was unable to find the end zone through the air, completing 27-of-44 passes for 283 yards. With that, we give you our PFF-exclusive takeaways from the contest for each team. Another week, another excellent showing for Ryan. The 2016 MVP is playing as well as he did at any point last year during the past month, and finished the day without throwing a turnover worthy ball. He was able to operate at all levels of the defense and given plenty of time as his line allowed just seven pressures on 35 dropbacks. Those early season woes seem a thing of the past, with Ryan connecting on 9-of-11 of his passes further than 10 yards in the air. NFC be warned, Ryan (and this offense) has found itself. It’s hard to play any better than Jones did. He beat the Bucs on deep passes, on crossing routes, on out breaking routes, on … well you get the picture. No Buc could cover him, whether help was provided or not as he went off for a quite ridiculous 7.67 yards for every ROUTE that he ran. By way of comparison Cole Beasley has 7.6 yards for every CATCH he makes. Neal is the tone-setter on the Falcons defense, and a guy they look to when it comes to making a statement. With the Falcons up by a score, but the Bucs marching after two straight touchdown drives, his fourth down break up of a pass intended for Cameron Brate was the play of the game, and in keeping with what Atlanta has come to expect from Neal. There’s no sign of a sophomore slump here. The less-heralded memeber of the Falcons secondary, but no less important. Allen himself made a couple of big plays, none more so than the play that brought up the fourth down as he diagnosed the whip route Adam Humphries was running to bring him down for a short gain. After a sluggish start to the season with too many missed tackles, Allen is playing at the level that helped the Falcons reach the Super Bowl. A good day for Fitzpatrick who showed he can move the ball, especially if you keep him clean. The problem, and why he’s a backup, is that as good as he was when given time, he struggled on the 14 plays he was pressured, completing just 5-of-13 passes. That wasn’t his only problem though as despite his weapons he was unable to complete any pass further than 20 yards in the air. So a solid day where he never put the ball in danger, but one where he was unable to keep up with a fast-scoring Falcons offense. It’s been a largely disappointing season for the third-year tackle who has struggled most of the season in pass protection. But this was one of his better games of the season, allowing just one quarterback hit and regularly displaying his strength in the running game. Consistency has long been an issue for the former Penn State lineman, and it remains to be seen as to whether this is the start of him turning the corner, or another false dawning. No player on defense had themself the kind of game they’ll be telling their grandchildren about, but Gholston was particularly stout against the run and regularly too much for a tight end to block one-on-one. He finished second on the team with three defensive stops, his second-highest number in a game this year. Not a great day for any Bucs cornerback but Smith walked out with the worst lowlight reel with the 2016 fourth-rounder regularly finding himself matched up one-on-one with Julio Jones. Five of the seven catches he allowed went to Jones, including an ankle-breaking touchdown where Smith was badly beaten on a double move.